Teshie and Nungua, on the coast 18-22 km southwest of the city centre, are inhabited by the indigenous Ga people of Accra. This means, among other things, that most properties are family homes, ie. they have been handed down through the generations and are usually not for rent. The mixed-income population comprises fishermen and fishmongers, traders, drivers and office workers. Housing is in a mix of old in some cases, pre-dating the colonial era and more modern buildings and most is of the compound house type. The areas are poorly planned and crowded and become muddy during the rainy season (April-July and September-November) due to poor drainage. However, there are basic services such as water and electricity and supplies are reliable. Telephone lines can be installed on request. Teshie and Nungua have post offices, internet cafes, schools (creche, nursery, primary, junior secondary and senior secondary) including the Teshie Orphanage, shops, bookshops, banks, police stations and the Teshie and Nungua markets respectively. There are also churches and mosques in these areas and there is a lively nightlife. Teshie and Nungua are also renowned for the coffins produced by Ga carpenters in the shape of canoes, fish, leopards, cars, houses, Bibles and a host of other motifs. The colourful and fanciful coffins unambiguously celebrate life's work and achievements (for example, a fisherman would be buried in a fish-shaped coffin) while at the same time proclaiming the family's prominence and wealth. 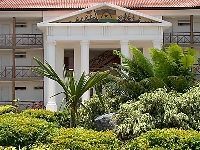 Teshie is home to the Ghana Military Academy, which is within walking distance from the famous Next Door Beach Resort, one of Accras most popular entertainment spots, located on the Beach Road. Between Teshie and Nungua are the Teshie-Nungua Estates, dating from the early 1970s, containing houses and apartments but here there are rampant water shortages and residents need tanks for storing water. Trotros and taxis connect these areas to most parts of the city. However, traffic is extremely heavy, particularly in the run up to, and during festive seasons such as Christmas and Easter.